Broadland Aerials have been serving Norwich and the surrounding area for almost 20 years. We have built up a great reputation for value and excellent customer service. 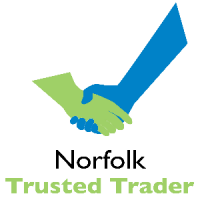 We are proud to be long standing members of Norfolk Trusted Trader. This is an iniative set up by Norfolk Trading Standards to help consumers make the right choice. Our vans are fully stocked to cover any job we encounter and we strive to offer a first visit fix for most of our customers requirements. As a limited company with £5 million public liability insurance you can be sure you dealing with a company that cares. We are recommended by John Lewis, Richer Sounds, Pymm & Co lettings to name just a few as their recommended Aerial and Freesat installers. 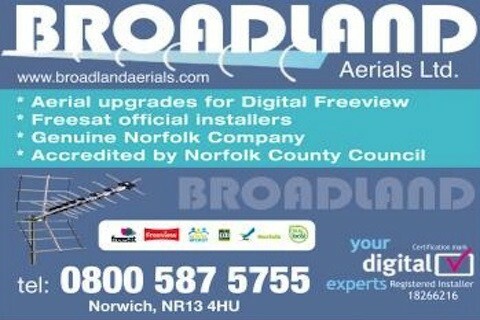 Broadland Aerials can help if you need a new aerial, an aerial upgrade or extra TV points around the house. We can also distribute your Sky signal to other televisons. If you require a satellite installation we install Freesat and specialise in siting the satellite dish and cables as neatly and discreetly as possible.